In a painting in any medium, treatment of light is a vital consideration. While the landscape photographer has to work with available light, artists can manipulate it to their advantage, changing it, intensifying it, rendering a much softer, atmospheric light or create a dramatic sense of light and dark, and so much more. It pays to study how the top artists have treated the light in their compositions when you visit an important exhibition or collection. This scene on the Norfolk coast shows part of the composition bathed in late afternoon sunlight, as it throws the emphasis on the central building, the two figures and the boats. I achieved hard edges on the buildings set against a dark sky by using masking fluid, rubbing it off once the background washes had dried, and then painting in the details on the buildings and the rest of the scene, completing everything apart from the shadows in the foreground. At that point I often trundle off for a coffee, or if it’s late I’ll finish for the day. This allows the washes to dry completely – in fact I’ll often get on with another painting at that point. With the whole painting completely dry I wash clean water right across the foreground, taking it up into the lower sky area. Make sure that you take the water some distance beyond where you intend to create the soft edge, as water has a habit of creeping further than you might think. I then apply a mixture of French ultramarine and cadmium red over the shadow area, including the darkened left-hand buildings and the far right-hand hedgerow. This wash blends nicely into the wet paper, creating soft-edged shadows, with the area I wished to highlight being left untouched. If you are a little wary of this technique try it out firstly on old paintings that have not worked well, so that if things really do go wrong it won’t matter. 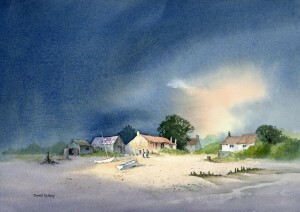 This entry was posted in atmosphere, David Bellamy, Glazing in watercolor, Soft edges, Tones in watercolor, watercolour, watercolour landscape painting by David Bellamy. Bookmark the permalink. Thank you for this advice David i will try it out ASAP. beautiful painting David I have learnt so much from you over the years, I just wish I could walk like you do and capture those wonderful subjects of yours. Another great tip from the watercolour master! Thank you David. Magnifique . les explications sont fortes intéressantes.A retenir pour de prochaines aquarelles.Bravo DAVID. Another of your ex students who has trouble in walking, you never fail to inspire me.